When they first appeared, wireless mics operating in the 2.4GHz band caused lots of interest, offering licence-free operation anywhere in the world, thanks to a digital-based technology incorporating encryption, status and control-data transfer — and, of course, top-quality audio. The first such ‘affordable’ system from AKG was their innovative DMS70 Quattro, which I tried, very much liked, and subsequently purchased along with a set of four AKG D5-based handheld mics. The Quattro was one of the most convenient, high-quality wireless mic systems I’d encountered at such a reasonable price. I’ve been happy with it ever since and have used it many times on a variety of live-sound jobs. The original Quattro system was, however, potentially vulnerable to interference from other nearby devices operating on the same band (such as mobile phones and Bluetooth equipment), but the receiver incorporated technology which — in my experience — was effective in reducing such interference. The one issue which did cause problems under some circumstances was the occurrence of brief signal dropouts, although in my own experience most of these were not real dropouts resulting in a loss of audio. On a few occasions I had singers telling me — both during and after a live set — that their mic had briefly stopped working, which I always found puzzling as I hadn’t noticed anything amiss. On one occasion I remember a singer saying (live over the PA) that the mic wasn’t working but all the time I could see the signal on my meters and clearly hear it on the front-of-house speakers. After some hours testing and trying to replicate the problem I discovered that, from time to time, the green LED indicator on the mic body would go off but without interrupting transmission, leading the user to assume that the mic itself was off. Only once did I notice any significant dropout, and that was during a product launch in a retail environment with all sorts of nearby devices (phones, tills, etc) of exactly the sort warned about in the manual! 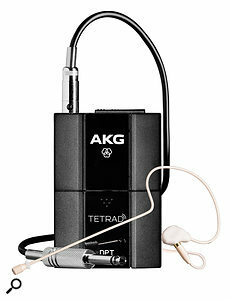 Now AKG have introduced the Tetrad system, which has the same basic functionality as the previous version. It’s a four-channel, fully automatic 2.4GHz system with dynamic frequency selection (ie. it switches frequencies automatically as necessary), and it uses the excellent D5 or slightly lower-specification P5 capsules. There are some physical changes to the receiver, as well as the inclusion of an anti-dropout technology called ‘DroCon’, so-called for ‘dropout concealment’. This uses extrapolation and advanced filtering methods to rebuild sections of missing signal and effectively conceal clicks caused by dropouts. What’s really impressive is how quickly this complex processing is implemented, requiring only two milliseconds to process all four received channels. With all that technology working in conjunction with automatic live channel switching, automatic detection and re-sending of lost signal blocks, plus standard twin-antenna diversity, AKG appear to have left no avenue unexplored in pursuit of reliable transmission. The system components, which are available as preconfigured sets and also as individual items, are the stationary DSR Tetrad four-channel receiver, a beltpack-style transmitter for use with lapel/headworn mics or instruments, and two variants of a handheld microphone transmitter. The ‘Vocal’ sets each come boxed with a DSR four-channel receiver and a single transmitter (either the P5 or D5 handheld mics), while the Performer set dispenses with the handheld mic but includes a DPT pocket transmitter and a C111 ear-hook mic. The already reasonable price then looks even more attractive should you wish to add more mics, as you only need to purchase extra transmitter units to work with your existing multi-channel receiver, so you can grow the system as requirements dictate or finances allow. All of the component parts are readily available from AKG retailers. At the heart of any Tetrad system is the DSR four-channel diversity receiver; it is built into a very neat casing that can be used free-standing (in which case it is slightly under 12-inches wide) or rackmounted using the included cast rack ears and fixings. The simple black look is appealing and understated in what you might call classic AKG style, with an illuminated power switch and four sets of controls consisting only of an assignment button and rotary output level control for each channel, with associated RF status and overload LEDs. The detachable antennae mount on the rear of the receiver by threaded coaxial connectors that appear to be of good quality and which screw on easily. If the receiver is to be rackmounted, the rack ears are fixed to each side and also serve as mounting points for the included antenna extensions so that the antennae can be front-mounted. I think this is a significant improvement over the old Quattro design, which used non-detachable front-panel antennae. 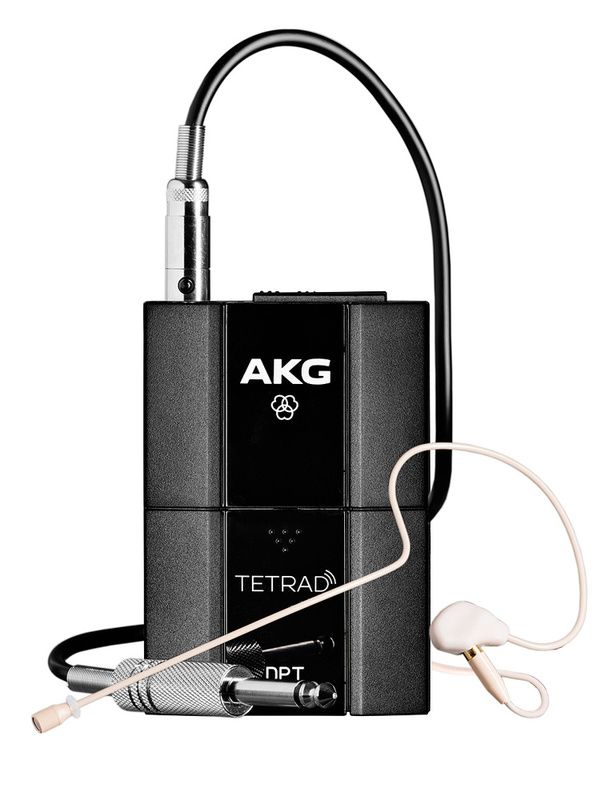 The DPT beltpack transmitter comes with an AKG C111 ear-hook vocal microphone. At the rear of the receiver are the balanced XLR outputs for each channel, and also a local combined output that carries a mono mix of all channels, as controlled by the front-panel level settings. The mix output could be particularly useful in a simple application where no other mixer is required and the mix output is fed straight to a powered speaker, or where the number of stage feeds or mixer inputs has to be limited. As previously mentioned, the 2.4GHz area is a pretty crowded place, and in anticipation of a less-than-ideal operating environment AKG have provided a three-stage anti-interference control that can minimise the effect of nearby devices. Although a very slight delay is involved it’s not enough to affect a live performance, and none of my users noticed when I switched this function in. There will always be a concern around overall system processing time, especially when a digital mixer is in the path, but the technology seems to be delivering acceptably small delay times that are perfectly manageable in all but the most critical applications. The two DHT handheld microphone models are outwardly similar and share substantially the same transmitter electronics and user controls. They are both fitted with dynamic supercardioid capsules but the D5 has a higher-performance version taken straight from the popular and successful D5 stage mic; the P5 version is a lower-cost option, with a somewhat reduced frequency response of 70Hz to 16kHz (the D5’s is 70Hz — 20kHz), and a slightly smaller dynamic range. My review set was blessed with the D5 variant, which is the one I’d personally favour as I use a lot of wired D5 mics in my own rig; also my own DMS Quattro system includes four D5 radio mics, so all my standard go-to dynamics have exactly the same performance. The Tetrad DHT wireless mics feel nicely balanced and are comfortable to hold; weight-wise I think they seem lighter than they look and have a high-quality finish and feel. I’ve never had anything but positive comments from performers who’ve used them, and I even had one client specifically ask for D5 mics as his band were making a live video and their manager just thought they “looked really cool”! In operation the Tetrad mics are easy to set up; the lower half of the casing unscrews and slides off to reveal the battery compartment and an inner body cylinder which houses the transmitter and antenna sections. As channel setting involves pairing the mic with an available receiver channel there are no frequency selector controls on or inside the mic, there’s just a pairing button and a ‘Hi/Lo’ sensitivity switch that varies the maximum input SPL by 13dB with an absolute maximum (in the low position) of 142dB. The DHT transmitter uses two AA batteries, and either alkaline (six hours use) or NiMH (seven hours) are suitable. I didn’t have an opportunity to run a set of batteries right down but I did two full concerts — a total of around five hours — on one set of alkalines (the black and gold ones), and normally I’d use a fresh or recharged set for every performance, so no worries there. I found that removing the first one can be a bit fiddly as there’s nothing to get hold of — it’s a fingernail-on-one-end job — but the second one can be simply pushed out from the other side, and they stay firmly in place during normal use. The Tetrad DPT pocket transmitter has exactly the same function as the handheld versions, but an external mic or other source must be connected via a mini-XLR input connector, which supplies 4V via pin 3 for devices that require a power source, such as the included C111 mic. If using non-AKG microphones it would be advisable to check their output wiring before connecting to this input. Inside the battery compartment is a rotary sensitivity control which requires a small screwdriver to be adjusted — happily there is one tucked away inside the lid, which is a nice touch. Pairing with the receiver is accomplished in exactly the same way as for the handheld mics, and the indications from the LED are also the same. Although these days we expect ‘plug and play’ operation from most of our audio equipment, wireless mics (especially when used in multiples) can still be tricky unless they incorporate automatic channel-seeking and Tx/Rx pairing functions, which are generally only found on more upmarket models. The Tetrad system really is about as easy as it gets — the single supplied transmitter is preconfigured to operate on channel one of the receiver, so as soon as they are both switched on they will just work, right out of the box. If additional transmitters are involved, or if for some reason you wanted to use your single mic on a different receiver channel, then allocating channels is quick and straightforward. Each transmitter and each receiver channel has a ‘connect’ button, and a quick press of either will result in the current paired transmitter or receiver channel LED to flash for a few seconds so that you can quickly identify the Tx/Rx pairs. To assign, say, a handheld mic to a particular receiver channel, press and hold one of the receiver channel connect buttons for more than a second. When it flashes, simply press the connect button on a transmitter and the two are then assigned to each other, using an available clean RF channel. The neat thing about this process is that it can be initiated from either the receiver or the transmitter, as the digital information flow is two-way. In the interests of conserving battery life, the transmitters will also switch off (after about two minutes) if the receiver is switched off, so after the soundcheck you can just power off the receiver and the mics will turn off all by themselves — and will of course need to be locally switched on again, which is by far the safest option for live sound. Once all is set up, the system will fire up using all the same channel allocations every time, and will automatically switch frequencies to avoid interference. Us mere mortals don’t need to know about this, so there’s nothing to indicate that this or any of the other clever under-the-hood business is going on — we can just get on with the show. As with any radio equipment, establishing a direct line-of-sight path between transmitters and receiver is always the best option, as is putting the minimum distance between them; to this end an ideal position for the receiver is at the front or side of the live stage, where the diversity technology should cope with brief obstacles in the RF path. I used the DMS Tetrad on three live shows and let various people use it in the rehearsal studio. Everyone who tried it liked both the sound quality and the feel of the handheld mic itself; I used the sensitivity switch in the ‘high’ position all the time and didn’t encounter any situations where the mic struggled to handle strong vocals. I experimented with transmit distances, and achieved good stable results at 30m in the open air (the same length as my Cat 5 cable on that occasion, and the manual says that the AKG system is specified to 50m), and front-to-back in two large concert halls with line of sight. I had no problems with dropouts or signal loss when I used the mic and receiver either side of a solid wall, and at home I managed to get three rooms and part of a corridor away (approximately 20 metres) before I lost clear audio. I’d have more confidence in using the DMS Tetrad in a less-than-ideal environment than with my old Quattro system, simply because it incorporates the DroCon technology and the older system doesn’t, but having said that I still like my old setup and will continue to use it. The main limitation of the DMS Tetrad is probably the channel count — you can only use two sets (that’s eight channels) together, but if you’re already the lucky owner of a DMS70 Quattro set (or even two) then, because they’re not cross-compatible, I reckon you could run 16 digital channels using the two systems together, and have tremendous fun. There are various systems and components available which make direct comparison difficult, but look at the 2.4GHz product lines from all major manufacturers, including but not limited to Audio-Technica, Line 6, Shure and Sony, as well as Sennheiser’s 1.8GHz options. Neat, quick and easy setup. High-quality sound — if you like D5 mics you’ll love this. DroCon and other technologies included should give reliable, dropout-free operation. A good rackmount kit gives the option of having front or rear antenna mounting. Built-in mix function on the receiver. An internal power supply would be preferable. Have to be careful of other 2.4GHz devices in proximity — in this band, interference is always a consideration. The DMS Tetrad delivers clean high-quality audio, is incredibly easy to set up and use, doesn’t require an operating licence and can be used worldwide. Vocal P5 Set £558.99, Vocal D5 Set £490.83, Performer Set £558.99, P5 Transmitter £168.99, D5 Transmitter £209, DPT Transmitter £209, DSR Receiver £399. Prices include VAT. Vocal P5 Set $699, Performer Set $699, P5 Transmitter $199, D5 Transmitter $249, DPT Transmitter $249, DSR Receiver $489.